The traditional definition of literacy is considered to be the ability to read and write, or the ability to use language to read, write, listen, and speak. 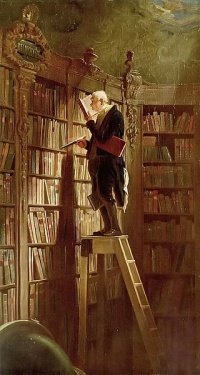 The history of literacy goes back several thousand years, but before the industrial revolution finally made cheap paper and cheap books available to all classes in industrialized countries in the mid-nineteenth century, only a small percentage of the population in these countries were literate. Up until that point, materials associated with literacy were prohibitively expensive for people other than wealthy individuals and institutions. For example, in England in 1841, 33% of men and 44% of women signed marriage certificates with their mark as they were unable to write. Only in 1870 was government-financed public primary education made available in England. Literacy is thought to have first emerged with the development of numeracy and computational devices as early as 8,000 BCE. According to Stephen Chrisomalis, independent script development occurred at four times in human history in Mesopotamia, Egypt, lowland Mesoamerica, and China. The earliest forms of written communication originated in Sumer, located in southern Mesopotamia in 8000 BCE. Peter Easton states, during this era, literacy was "a largely functional matter, propelled by the need to manage the new quantities of information and the new type of governance created by trade and large scale production". Denise Schmandt-Besserat argues that writing systems in Mesopotamia first emerged from a recording system in which people used impressed token markings to manage trade and agricultural production. The token system served as a precursor to early cuneiform writing once people began simply recording information on clay tablets. According to Chrisomalis, proto-cuneiform texts exhibit not only numerical signs, but also ideograms depicting objects being counted. These examples indicate that early acts of literacy were closely tied to power and chiefly used for management practices. According to social anthropologist Jack Goody, there are two interpretations that regard the origin of the alphabet. Many classical scholars, such as the renowned historian Ignace Gelb, credit the Ancient Greeks for creating the first alphabetic system (c. 750 BCE) that used distinctive signs for consonants and vowels. But Goody contests, “The importance of Greek culture of the subsequent history of Western Europe has led to an over-emphasis, by classicists and others, on the addition of specific vowel signs to the set of consonantal ones that had been developed earlier in Western Asia”. Thus, many scholars argue that the Western Semites of Northern Canaan (modern-day Syria) invented the consonantal alphabet as early as 1500 BCE. Much of this theory’s development is credited to English archeologist Flinders Petrie, who, in 1905, came across a series of Canaanite inscriptions located in the turquoise mines of Serabit el-Khadem. Ten years later, English Egyptologist Alan Gardiner reasoned that these letters contain an alphabet, as well as references to the Canaanite goddess Asherah. In 1948, William F. Albright deciphered the text using additional evidence that had been discovered subsequent to Goody’s findings. This included a series of inscriptions from Ugarit, discovered in 1929 by French archaeologist Claude Schaeffer. Some of these inscriptions were mythological texts (written in an early Canaanite dialect) that consisted of a 32-letter cuneiform consonantal alphabet. Another significant discovery was made in 1953 when three arrowheads were uncovered, each containing identical Canaanite inscriptions from twelfth century BCE. According to Frank Moore Cross, these inscriptions consisted of alphabetic signs that originated during the transitional development from pictographic script to a linear alphabet. Moreover, he asserts, “These inscriptions also provided clues to extend the decipherment of earlier and later alphabetic texts”. The consonantal system of the Canaanite language inspired alphabetical developments in subsequent languages. During the Late Bronze Age, successor alphabets appeared throughout the Mediterranean region and sub-developed into three languages: Phoenician, Hebrew and Aramaic. According to Goody, these cuneiform scripts may have influenced the development of the Greek alphabet several centuries later. Historically, the Greeks contended that their language was modeled after the Phoenicians. However, many Semitic scholars now believe that Ancient Greek is more consistent with an early form Canaanite that was used c. 1100 BCE. While the earliest Greek inscriptions are dated c. eighth century BCE, epigraphical comparisons to Proto-Canaanite suggest that the Greeks may have adopted the language as early as 1100 BCE, and later “added in five characters to represent vowels”. Phoenician, which is considered to contain the first “linear alphabet”, rapidly spread to the Mediterranean port cities in the northern Palestinian region. Some archeologists believe that Phoenician scripture had some influence on the developments of the Hebrew and Aramaic alphabets based on the fact that these languages evolved during the same time period, share similar features, and are commonly categorized into the same language group. When the Hebrews migrated to Palestine between 1200 and 1001 BCE, they also adopted a variation of the Canaanite alphabet. Baruch ben Neriah, Jeremiah’s scribe, used this alphabet to create the later scripts of the Old Testament. The Early Hebrew alphabet was prominent in the Mediterranean region until Assyrian rulers exiled the Jews to Babylon in the sixth century BCE. It was then that the new language (“Square Hebrew”) emerged and the older language rapidly died out. The Aramaic alphabet also emerged sometime between 1200 and 1001 BCE. As the Bronze Age collapsed, the Aramaeans moved into Canaan and Phoenician territories and adopted their scripts. Although early evidence of this writing is scarce, archeologists have uncovered a wide range of later Aramaic texts, written as early as the seventh century BCE. Due to its longevity and prevalence in the region, Achaemenid rulers eventually adopted it as a “diplomatic language”. The modern Aramaic alphabet rapidly spread east to the Kingdom of Nabataea, then to Sinai and the Arabian Peninsula, eventually making its way to Africa. Aramaic Merchants carried older variations of the language as far as India, where it later influenced the development of Brahmi scripture. It also led to the developments of Arabic, Pahlavi (an Iranian adaptation), “as well as for a range of alphabets used by early Turkish and Mongol tribes in Siberia, Mongolia and Turkestan”. The Aramaic language eventually died out with spread of Islam and its influence of Arabic. Until recently it was thought that the majority of people were illiterate in ancient times. However, recent work has challenged this long held notion. 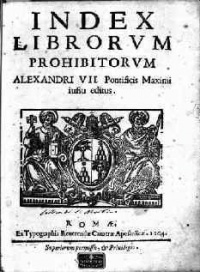 Anthony DiRenzo asserts that Roman society was “a civilization based on the book and the register”, and "no one, either free or slave, could afford to be illiterate". Similarly Dupont points out, "The written word was all around them, in both public and private life: laws, calendars, regulations at shrines, and funeral epitaphs were engraved in stone or bronze. The Republic amassed huge archives of reports on every aspect of public life". When the Western Roman Empire fell apart literacy became a distinguishing mark of the elite, and communications skills were politically important. In 12th and 13th century England, the ability to recite a particular passage from the Bible in Latin entitled a common law defendant to the so-called benefit of clergy—i.e., trial before an ecclesiastical court, where sentences were more lenient, instead of a secular one, where hanging was a likely sentence. Thus literate lay defendants often claimed the right to benefit of clergy, while an illiterate person who had memorized the psalm used as the literacy test, Psalm 51 ("O God, have mercy upon me..."), could also claim benefit of clergy. The ability to read did not necessarily imply the ability to write. The 1686 church law (kyrkolagen) of the Kingdom of Sweden (which at the time included all of modern Sweden, Finland, Latvia and Estonia) enforced literacy on the people, and by 1800 the ability to read was close to 100%. But as late as the 19th century, many Swedes, especially women, could not write. 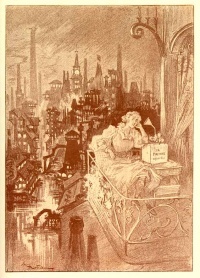 That said, the situation in England was far worse than in Scandinavia, France, and Prussia: as late as 1841, 33% of all Englishmen and 44% of Englishwomen signed marriage certificates with their mark as they were unable to write (government-financed public education was not available in England until 1870 and, even then, on a limited basis). Historian Ernest Gellner argues that Continental European countries were far more successful in implementing educational reform precisely because their governments were more willing to invest in the population as a whole. The view that public education contributes to rising literacy levels is shared by the majority of historians. Unless indicated otherwise, the text in this article is either based on Wikipedia article "Literacy" or another language Wikipedia page thereof used under the terms of the GNU Free Documentation License; or on original research by Jahsonic and friends. See Art and Popular Culture's copyright notice. This page was last modified 11:37, 4 July 2017.